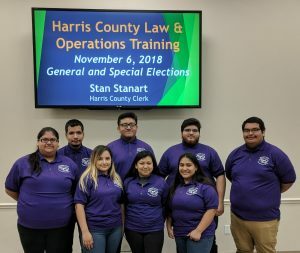 Students from Northside High School presented their 2018 Together with Tech Project at the Harris County Clerk’s office. Two student-led groups from HISD’s Northside High School scored big recently, winning grants to improve their 2018 Together with Tech projects. The students received nearly $20,000 after submitting a formal funding request to build upon the projects they presented at this past year’s Together with Tech Student Conference, which was held in April. Although the groups did not place at the conference, they received valuable feedback, and the panel of judges encouraged them to continue with their work. But that would take funding. One project, a Rain Garden, received over $14,000 in funding. Those funds will be utilized for research, training, and the garden build out. According to Noyola, the garden will be used to help mitigate storm-water runoff in the area due to flooding and is expected to be completed Spring 2019. The second project that received funding is a film festival. Students were awarded $5,000 in funds for AV equipment to help them create their films. Together with Tech is HISD’s student-led technology conference. Students from around the district present on technology-based platforms. The conference highlights the impact of 1:1 technology. The 2019 Together with Tech Conference will be held in April, and project submissions are being accepted now. Visit houstonisd.org/togetherwithtech for more information. This entry was posted in Achievement/Recognition, News and tagged Northside High School on December 18, 2018 by HISD Communications.